If one were to design the perfect location for a family function or a special occasion the Ashbrook Arms Town House and Restaurant in Durrow, Co. Laois would be it. This beautiful venue has everything – a central location, it is easily accessible, it is a wonderful historical house which is stunningly decorated, there is a fabulous restaurant and facilities for private functions. Just one look at the photographs of the Ashbrook Arms and you can see what we mean. This is the sort of place where you would happily host your Silver or Golden wedding anniversary or an intimate dinner for two. The building was originally one of the Bianconi coach houses built around the country where weary 18th century travellers could rest on long journeys. It was purpose built by Lord Ashbrook, proprietor of Durrow, in 1777. The building was lovingly restored in 2005 and returned to pristine condition as a guest house and restaurant by the Murphy family. While the front of the house faces onto the main road, the rear has a beautiful sweeping lawn which extends down to the river Erkina – a lovely back drop for photographs. The ambience at the Ashbrook Arms and the warm welcome given to all guests by the Murphy family has been much commented on in international tourism websites such as TripAdvisor where there are numerous very complimentary comments on the beautiful house and the quality of the service. Many of the comments on TripAdvisor are in relation to the staff and their willingness to be of assistance in any circumstance and also on the large breakfast selection. Indeed the breakfast menu and the flexibility of the staff in accommodating different requests are much commented on. 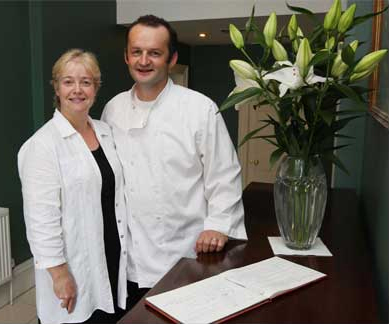 Sean and Rosezita Murphy have already established a glowing reputation for their hospitality, food and service and if the positive comments they have received are anything to go by then their future success is assured. In fact Rosezita, as the hostess and front of house person, comes in for glowing compliments from numerous visitors who reviewed the Ashbrook Arms on TripAdvisor. Husband and co-owner Sean, jokes that as he is in the kitchen no one gets to see him, but his magnificent menu has been noted.